September 25 is National Voter Registration Day. Your voice matters, your vote matters and not just during presidential elections. This November, be sure to go to the polls. OYUnited is hosting a voter registration challenge. Be sure you’re registered, and then urge your peers to register on or before September 25. First, are you registered and ready? Use our tool, in partnership with TurboVote, here. Why do you vote? Why does it matter to you? 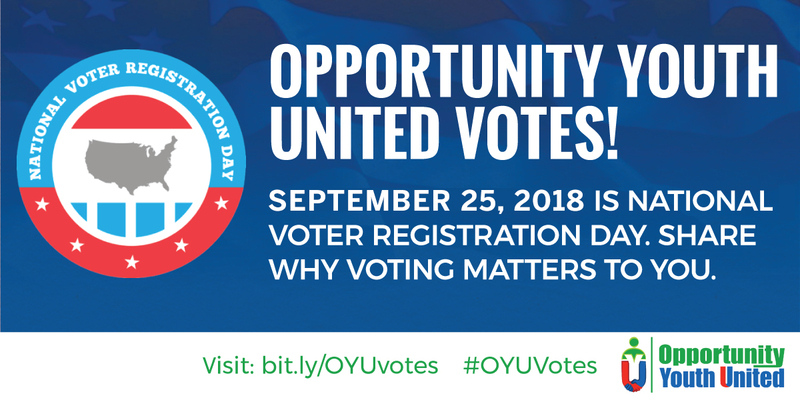 Make a short video, image/meme or social media post and share it with the hashtags: #OYUvotes and #NationalVoterRegistrationDay (bonus: add a hashtag for your city or town!). Be sure to include these tags so we and our partners can help amplify your post. Check out Nonprofit Vote’s resource page to get the info and deadlines for Voting in Your State. Questions? You can call 866-OUR-VOTE to get local information and answers to your questions (or visit the ElectionProtection.org site). Share this with your friends and networks! Use our NVRD social media toolkit to spread the word. Bringing Youth Power to Polls at the #YouthPower2018 Summit OYUnited: Today is #NationalVoterRegistrationDay!